As my 2nd restyling feature, I picked a piece I rarely wear but for event/avant gard occasions. 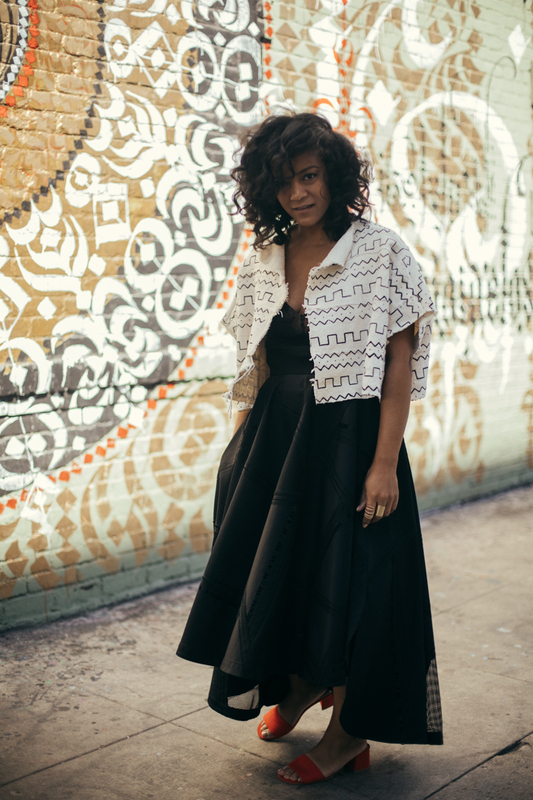 This Robert Rodriguez maxi circle skirt called to me years ago and I haven't tired of it since. 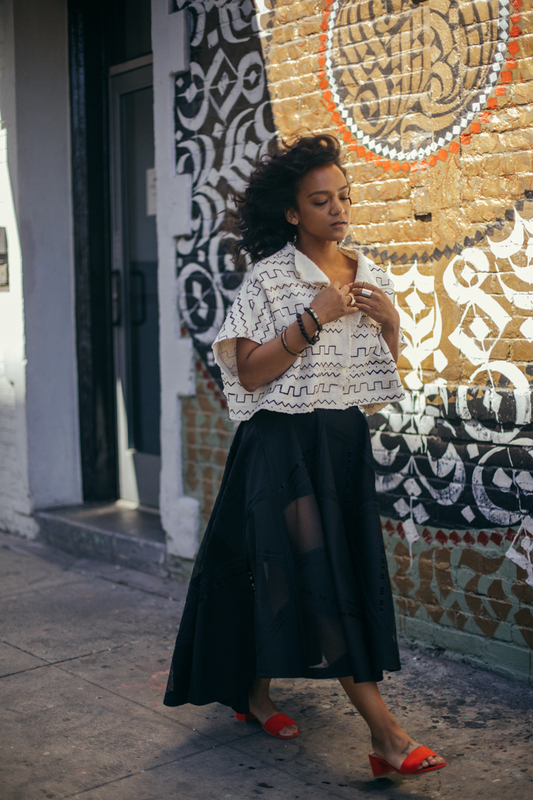 With mesh paneling, a cropped front and geometric embroidery, I found a skirt that was masterfully designed and executed. That's my sewer's perspective, lol - but as a curator of artful pieces, I highly covet this one and so appreciate it's uniqueness. a Spring/Summer look. All black with a cropped textured print, a pop of color, and gold accessories. As I shot this in the Arts District the other day, I did feel like I wasn't wearing an outfit for just walking and coffee (which is my usual go-to leisure activity when I'm not home). But it just depends on personal style. Some women wear stilettos to the airport so of course I can chill in this getup while sipping a pour-over. I just wouldn't. I would wear this on a date at the museum with Theo, or at a wedding. It's funny, I actually am planning on doing both of those things. 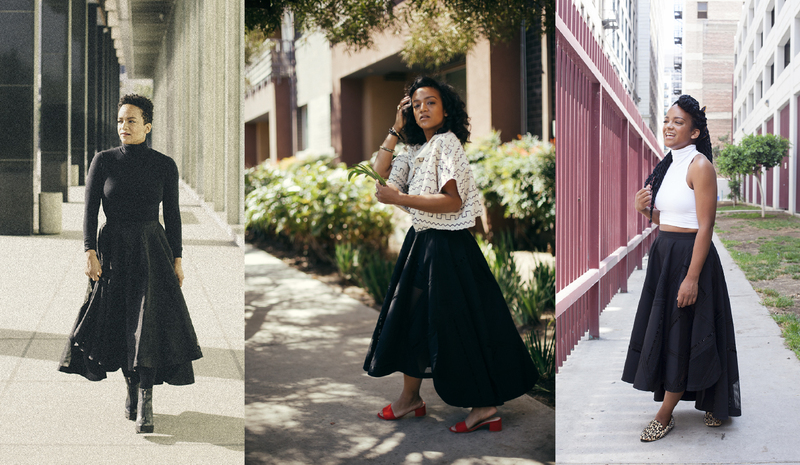 All you petite ladies out there, don't be afraid to wear a maxi skirt! - even if it's practically floor length. Simply keep the shoes and top super simple and the top better be cropped! It lengthens you. Heels are best with such a whale of a skirt buuuut if ya know me, you know I don't give a hoot about the rules. These days, there aren't any rules anyway so wear what you love. Anyway, I aint gonna lie, mama felt saucy in this ensemble. All black, a bit of lace, a spicy red shoe, big hair.... I felt like I was back in Spain watching flamenco dancers putting on shows in the streets of Seville. So all black for Spring is certainly not festive, I know. I've never been into pastels but I was delighted to see that a couple of the leading colors for Spring 18' is tomato and paprika! I love a good orangey red and for Spring, both go quite will with a plethora of pinks and pale blues. Just you wait! I hope you liked this 2nd installment of my Style After Style series! This series really is the roots of The Tiny Closet. Styling and re-styling is the name of the game when you're working with 28 pieces year-round. After 6 years of rocking a tiny (sometimes minuscule) closet, I'd say I've gotten good at what I do here. But what's great about restyling is there is always another way to wear your clothes, another ensemble to put together, another perspective. And I still love talking about it. So join me next Thursday for another Style After Style feature! Love this look, and the ways you’ve mixed this skirt up in the past. The shoes are also fierce! May I ask where they’re from? I'm loving this series! You are just fabulous. This look is everything!! Thank you, Faith! Glad you're enjoying the series so far!